Joint personnel of Satpol PP, PPSU, PHL, Water Resources Sub-dept., assisted by army/police tore down 48 semi-permanent buildings standing on the drainage, Jalan Duri Baru Gg. V, RW 05, Jembatan Besi, Tambora.
" 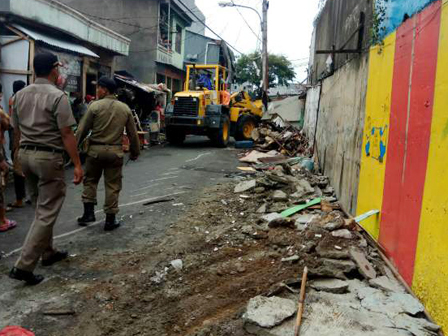 We've socialized and sent warning letter to them first"
Tambora Sub-district Head, prior to demolishment, his side had held socialization first to the building owner. "We've socialized and sent warning letter to them first. Demolishment runs conducive and traders are aware of their existence on the drainage and violate Bylaw No. 8/2007 on Public Order," he expressed, Wednesday (9/27). Post-demolishment, he stated, the drainage will be refunctioned by dredging mud in order to minimize inundation during rainy season. "Mud in the drainage at Gg. Duri Baru will be dredged to minimize inundation when it rains," he expressed. Jembatan Besi Urban Village Head, Agus Mulyadi added there is no relocation to traders who have been selling on the drainage. "No relocation, because they develop the building illegally," he closed.